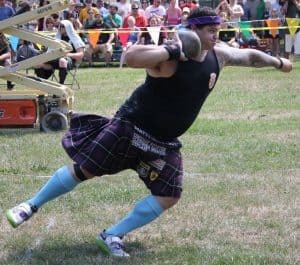 Heavy Weight Championship - BRIGADOON | Bundanoon Highland Gathering Inc. Competitors for 6 April 2019 are. Stone Put This event resembles the modern day shot-put but with a 16-18lb (7-8kg) stone picked from a local river. The throw takes place from behind the “trig” or toe board and is thrown for distance. There are several different throwing styles that can be used including the glide or spin. The throw is recorded by measuring the distance from the back of the trig to the mark the stone makes when it hits the ground. Each competitor is allowed three attempts with the best throw being recorded for the final score. 56-pound (25kg) Weight for Height In this back breaking event, the athlete tosses a 56lb(25kg) weight over a cross bar. 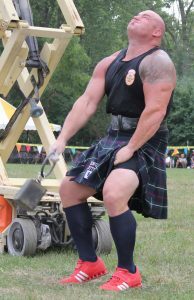 The weight is tossed with one hand only from a standing position and the athlete is allowed three tries at each height. The bar is raised until only one athlete remains. Top professional athletes can toss the 56lb (25kg) weight over a bar 18 feet (5 metres) off the ground! 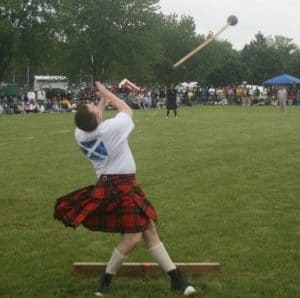 The caber is stood on its end, the athlete shoulders the Caber cupping the small end in his two hands. 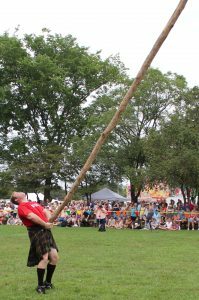 Once the Caber is balanced, the athlete runs and stops suddenly and while the larger top of the Caber is tipping forward, the athlete pulls upward on the small end with all his might, flipping it end over end. 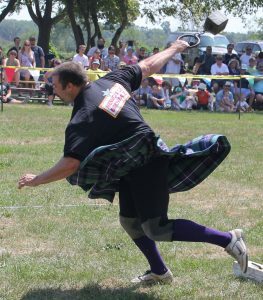 A judge runs behind the athlete and calls the score as though looking at an imaginary clock, with a perfect toss being 12:00 with the small end of the Caber facing directly away from the athlete, who is standing at the 6:00 position. Performed by member of the Tartan Warriors. Competitors are selected by invitation only. Due to the tight space and time constraints, athletes without any prior Heavy Events experience cannot be permitted to compete.